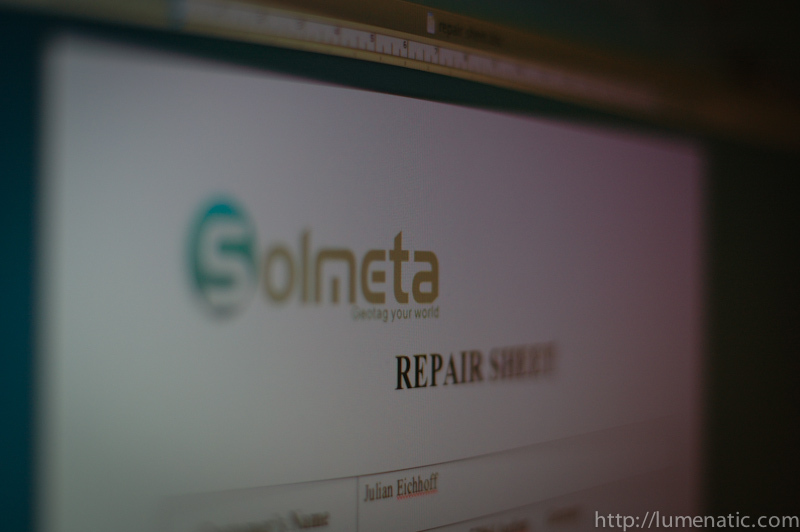 Quite quickly Solmeta responded to my repair inquiry. They regret the malfunction and offer free repair. I was given a repair return form and instructions on how to mail the item. To China that is. Now I packed a bubble wrap envelope and will post the thing tomorrow. That is good news and I am thrilled to learn how long the actual process will take with mailing-repair-returning. I am not sure what they mean by “DP-GPS”, but I assume it is something similiar to the cable solution Nikon offers in the GP-1 GPS module. As you can see in the picture (photo used with permission of Nikon Germany), the GP-1 offers a massive plastic socket which holds the connection port. This socket protects the plug when the cable moves. I wonder how the camera of the future might cope with GPS. Built-in sensors ? Or perhaps communicating the GPS information over the camera hot shoe when plugged in (no idea if this is possible with actual cameras). there must be a way to go wireless with geotagging (and writing the information directly into the picture file). Note: There are “wireless” solutions. These devices track your route point by point and save each position captured on the trip with a time stamp. When you are back home you download the pictures to your computer and an additional piece of software matches the timestamp on the pictures with the timestamp in the tracker. The corresponding location information is then written into the file. But I do not like such solutions as they pose an additional work step, therefore I go for the camera-attached geotaggers (with their own battery, because I have enough of battery sucky sucky). Also today I received a very nice email from punktGENAU Geoinformation, a company dedicated to supplying geotaggers to all you geeky photographers out there. punktGENAU distributes Solmeta products in Germany and Europe. Mr. Hofer gave some additional explanations on the problem I encountered, stating that the connection port must be completely wasted. For extreme usage Mr. Hofer recommends Dawntech or foolography geotaggers from his portfolio, they do not have the cable weak spot. The dawntech solution has a fixed cable. The foolography solution consists of a small bluetooth dongle, which is connected to the camera. The bluetooth dongle gets the geoinformation from a regular GPS device which you carry additionally. Both solutions do not have an internal battery. Also I was reminded that when buying your stuff at a German dealer you are offered the full service and support and a warranty of two years. You might not have that when buying in China.